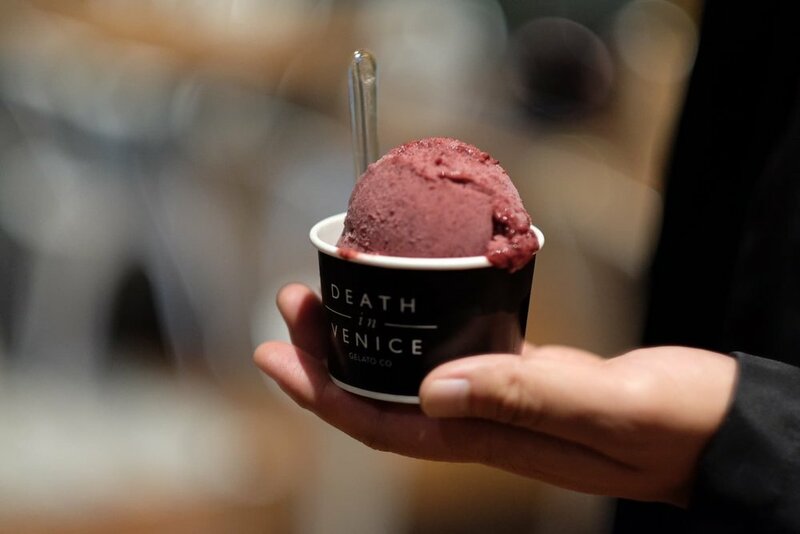 Death in Venice has a great reputation as a growing purveyor of some of the best gelato to be found in the city. We met the owner at a social event and we were excited to hear his story. 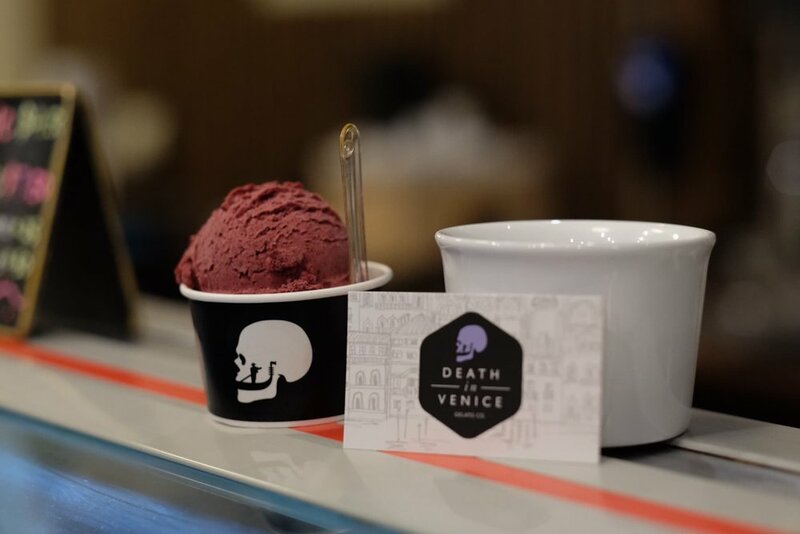 His gelato is quickly making the rounds in Toronto with some of the most creative offerings we’ve ever seen. We had the privilege of sitting down with Kaya to talk about his story. Andrew: Before we begin, just tell me how business is going. Kaya: Business is doing well. This year we really expanded our business. So we have this café that we turned into a vegan spot so I only…I kind of believe in a farm-to-scoop movement that I came up with. We really believe in working with the farms, basically working like a restaurant rather than a gelato shop in terms of how we do things. And I think plant-based gelato, things that come from a farm, needs its own kind of particular space, so we thought that our 536 Queen St. West location is well suited for that. And then we opened another location in Saks Fifth Avenue on Queen St. and there we have the whole selection and that has been a really good performer as well, and it’s opened us up to a new clientele. And we have a pop-up location on Adelaide, it goes between University and Victoria and every 2 weeks we change spots. We have a beautiful gelato cart that we purchased that we serve gelato on the street. That’s been going really well as well. We have some retail locations that have been doing well. We did a lot of catering in advance this year, that’s been a beautiful addition to our business. On the whole, no complaints. Busy. Being busy is good. A: And how long have you been doing this for? K: This is my third summer. I measure my business in summers. A: That makes sense. Why’d you decide to get into the gelato-making business? K: It was a bit of a half fluke, half kind of “I meant it” kind of thing. I was a chemical engineer and I became a chef and my chef career was pretty successful. I had really good jobs, I worked in really good restaurants, and in a short amount of time I became a chef with a very reputable catering company. And the next step would have been for me to open up a restaurant or a kind of business but at the time I didn’t feel like opening a restauraunt was a successful business model and I just…I had doubts about the whole system, the way it works…and that still stands to this day. I was looking into opening something else that satisfied my creativity kind of…itch, I should say. My creative itch. I was shopping for ideas…what’s culinary that I would like doing that’s out there. And then we took a trip with my girlfriend to Sicily, we did a motorcycle tour. And over there we had this gelato, it was beautiful, it was a great experience, and something kind of clicked at that point, like “Why don’t I do this?” I always had a history of doing really interesting ice creams in my chef years and people always kind of commented on it, so that, plus the experience, like, can we do it? Is it possible? A: Since you were talking about your trip to Sicily, I was going to ask you what’s the name behind the gelato and how you arrived at that pretty sweet logo? K: The name comes from Death in Venice; it’s a book by Thomas Mann. He’s one of my favourite authors, I love the book, and there’s a movie that’s called Death in Venice, which is based on the book by an Italian director named Luchino Visconti, one of my favourite directors, amazing movie. A: So tell me about the logo. K: The logo…I would have a hard time taking credit for it. We basically hired a company called Junction Design. Junction Design is owned by my good friends and at some point…like basically in the beginning you have very little money, or you have a set amount of money and you’re so cautious with money because you’re buying equipment and renting space. We didn’t have a lot of money to spend and hire a big firm. A: What’s the most popular gelato that you serve? K: It fluctuates depending on the weather and depending on timing. I’m also sort of a self-made social media guru, some things that I push really moves well. Like, if I really want to push a product I do a lot of social media posts. I kind of let people know. Currently our Peach Bellini, which is basically peach, Prosecco and basil, this time of year that always sells really well. I just made Corn on the Cob gelato. That’s one of our specialties. This year I changed up my recipe. The last two years I feel like it was less than ideal, I had issues with that gelato. This year I changed up the recipe and I was a little bit scared of how it was going to turn out but I think it was the best corn gelato I’ve ever made. A: Is there a gelato you’re most proud of? Just because it’s the most popular doesn’t always mean it’s the one you’re the most proud of to be serving. K: Rather than the gelato—this is going to sound weird—but rather than the gelato, I’m really proud of the produce that I find. I’m really happy with the peaches. Maybe this is a bit of a chef mentality. If I can find something that is unique, not a lot of people use, then that makes me…that gives me the most satisfaction. When something comes through our door that no one else has or I’m super happy with the quality, that’s the satisfaction I get most, more than the end product. I’m very critical of my own work. I don’t like taking gelato to friends’ parties because it makes me nervous. A: It makes sense to me. Since you’re on the topic of how people review…do you read reviews about Death in Venice? How do you react to good reviews and how do you react to maybe, not-so-great reviews? K: We get a lot of reviews from Yelp, Google and people…there’s a lot of people who like to leave reviews after they pay a visit to us. Most of them are very positive, people really like it. I feel like there is a small percentage of people, they’re more sensitive to their childhood likes. They want vanilla and chocolate, which we don’t make. I’ve seen people get upset over the fact that we don’t have vanilla and they demand an explanation that is, we don’t make vanilla because of X, Y, Z and they get quite confrontational. Sometimes we’ll go to fairs and events and they’ll get upset because we don’t have vanilla and they have a kid and their kid should have a vanilla gelato…so those people, I think they hate us. And then one time we got a death threat that was stuck on our window. 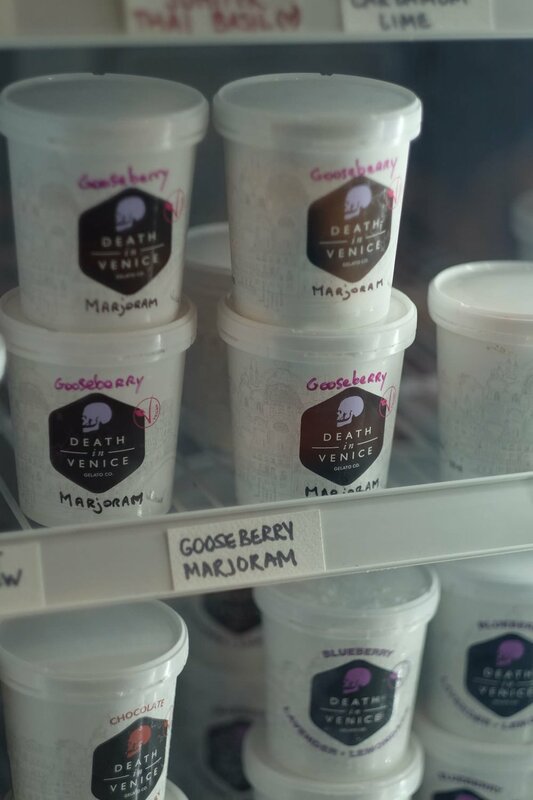 Someone made a very obscene comment about how our gelato is F’d up and we’re doing something we shouldn’t be doing and we should go back to traditional flavours. It was a very intense, long letter that was taped to our window. We definitely evoke a certain kind of reaction from people, negative or positive. A: I wonder how much of that is just from the fact that you make vegetarian/vegan gelato and how much it comes from people who dislike that. K: There’s a bit of that as well. Some people are like “Oh that’s vegan? Maybe I shouldn’t have that.” The V word definitely gives you a bit of a, are you in this camp or that camp kind of thing. I actually tend to say to people, it’s plant-based gelato rather than vegan gelato. A: You said you were a chemical engineer before and then you became a chef, tell us a bit about how you decided to enter the restaurant business. It’s not an easy business to transition into. K: I actually never thought that restaurants don’t pay well. In a way, I thought, you kind of find the job that pays well to you. You create that job. It wasn’t like “Oh my god I’m going to make a crappy amount of money my entire life.” I never felt like that was my goal. I never felt like I would just work at the back of a restaurant for 30 years and retire with my 4 missing teeth. That was never a goal. The goal was to do something special and I tend to believe in like, if you do a good job and you’re creative and you work hard, the most important thing, you’ll never go home hungry. There will be opportunities in life that you’ll be able to take advantage of it. K: Yeah, it never kind of scared me. It wasn’t a deterrent. But about the change, yeah I was a chemical engineer, I finished at U of T, I was working at Unilever, I was making Becel margarine. I always think it’s kind of funny that I make gelato now but I used to make margarine at some point in my life. I had a good job doing that, I got lucky and I moved up the ranks really fast but what ended up happening was that I lost my inspiration being there. Engineering is pretty tough. I’d always had this interest in cooking and at the time I knew somebody who was a chef at Scaramouche restaurant and I talked to him about how it works. He recommended I go to Stratford Chef School, because Stratford Chef School was kind of a compact school and essentially, it was a quick way to increase your skill level and become a cook. If I could get in there he said I should give it a try. So I told my engineering company that I was going to Australia for my masters because I was scared to quit and admit I was leaving a big opportunity behind. So I took a leave of absence for a year and I said if the cooking thing didn’t work I would just go back to engineering, so I didn’t burn any bridges and left it open for me to come back. And if you’re an engineer you can only practice your engineering skills here. You can’t just show up in Belgium and say “I’m an engineer, give me a job.” It doesn’t work like that. But if you’re a cook and you know how to use a knife, you can work in Japan or you can work in Cambodia. It’s nice to have that kind of international passport for finding a job. That part of the job was really appealing to me. A: And was there a favourite place that you cooked? K: In San Francisco I worked in this restaurant called Manresa. I think it’s the best restaurant that I worked in and the culture of the restaurant was quite amazing. It was a bit different from what I experienced in Europe. Europe was more tough on your psychology I’d say. This job was just as tough mentally and physically, but the working environment was such a positive environment that was so professional, and the restaurant was mostly staffed by females, it was a lot of female chefs. It was different compared to my European experience. In Europe the rate of females in the kitchens is a lot lower, so that was great to have that more respectful environment. That increased my productivity. A: If you’re not in your gelato shop, is there a favourite restaurant in Toronto that you like going to? K: There’s definitely good restaurants in Toronto but we…what do we like…like Bar Isabel is always a good place to eat where you can always count on good food. We like to go to Aloette, I haven’t been to Alo because it’s almost impossible to get a reservation. Black Hoof, before it closed down it was a place we really enjoyed going. To be honest, we travel and eat a lot. We were in New York recently so we ate at Blue Hill, which was amazing, and we ate at Cosme, which was fantastic as well. When we travel we kind of travel in style in terms of food. A: Let’s just say it was your last day on Earth and you had one last meal, what would that meal be? K: There’s this one Turkish dish that kind of peaked my interest in eating I think. When I was a little kid I didn’t eat a lot, my parents were having a lot of trouble with feeding me. They took me to this restaurant and they gave me this dish, it’s called iskender, it’s basically thin slices of kebab meat that’s put on pita bread with butter and tomato sauce. It’s a pretty simple dish but it’s hard to get it right. And ever since I ate that dish my appetite opened up and every time I go back home I eat that, and ridiculous amounts of it. So, my last day on Earth I’ll have that dish. A: Business is great now but has it always been great? Have there been any tough times you’ve had and how did you react to those times? K: The biggest breaking point was after five months opening the business, the place I was renting space at went bankrupt and they left—the space we’re talking in now—the owners left and we were left stranded without a lease because I was a subtenant. So taking over the lease of this massive space, turning it around. At the time I had just had a baby, so, with a newborn and a massive lease, it was definitely for the first 6 or 7 months after that were really tough. Turning that around was probably the most difficult thing I’ve done in my life. That was the most challenging part, but every month, every summer, has brand new challenges. A: What’s the best part of the job, what do you look forward to every day? K: The best part, to be honest, is making my own schedule and, I kind of, I can do anything! I can make any flavour, I do any festival. Just being in control of your own fate is a nice sensation. So, the satisfaction is a bit more deep. You live by the sword, you die by the sword kind of thing. If you’re successful and people like your product, your bank account is on the plus side. That’s something that you created and it’s hard for anyone else to take credit for your success. A: So you worked in the restaurant business for years but what was the best piece of advice you got as you were trying to start your business? K: No good advice or shortcut can replace the significance of hard work. Dedication, hard work, showing up. Unfortunately, we live in such an instantaneous society where everything is clicks and videos and self-promotion. We kind of forgot the significance of training and learning and being patient. Nobody has to be famous when they’re 21 years old. It’s ok to take your time and learn something and be good at it and start something. A: If someone was looking to open their own restaurant, or gelato business, whatever it is, but something in the food industry tomorrow, what would be the piece of advice you’d give them? K: I think…lowering your fixed costs. Toronto has turned into a monster with rental costs and taxes and wages. A lot of people are scared of making their calculations and seeing how little they’re going to earn or how much they’re going to lose because they’d rather not see it. I come across people and say “Hey, did you put this into your account? What about this and that?” and they say “Oh we’ll just make money and pay for it.” It doesn’t work like that. My biggest advice is make sure your math checks out. Your taxes, your wages, your TMI, blah blah blah, and then be realistic about your expectations. This is a long fight. This is not something you’re going to get rich through overnight. And really pay attention to your lease. The lease usually brings people down. Make sure you read it properly, all your documentation, they’re there for a reason. Always hire a lawyer before you sign anything even though it’s going to cost a little bit of money.